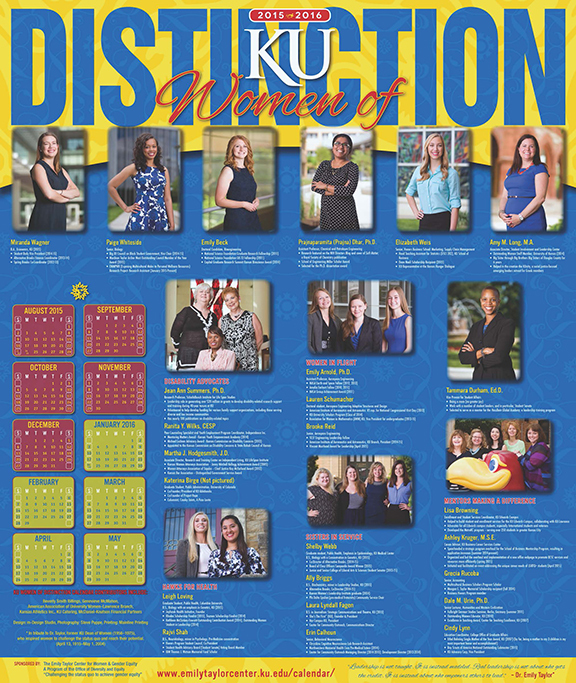 LAWRENCE — Twenty-five women with ties to the University of Kansas are featured in the 2015-2016 Women of Distinction calendar. The Emily Taylor Resource Center for Women & Gender Equity, which produces the poster-sized calendar, will host a reception to honor the women and their achievements Monday, Aug. 31. The women represent KU students, faculty, staff, administrators and alumnae who have distinguished achievements in their efforts at the university or in their community. Nine current students, seven alumnae and nine faculty and staff are featured on the calendar. Five areas of service and distinction also receive special attention through the calendar: Disability advocates, Hawks for health, women in flight, mentors making a difference and sisters in service. A reception to acknowledge this year’s featured women and their contributions will be from 4 p.m. to 5:30 p.m. Monday, Aug. 31, in the ballroom of the Kansas Union. The public is welcome to attend. The Women of Distinction calendars are free, although donations are accepted. They are available at several locations, including the KU Bookstore, Jayhawk Ink and the Emily Taylor Center, 4024 Wescoe Hall. Peer counseling specialist and Youth Employment Program coordinator, Independence Inc.
Graduate student, public administration, University of Colorado. Hometown: Denver. Center for Community Outreach managing director (2014-2015); development director (2013-2014).